True friend, protector and powerful intercessor! 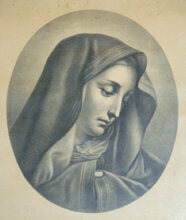 We ask for his protection, guidance and heavenly intercession for all the sick. St. Raphael the Archangel whose name means “Medicine of God” in Hebrew; is one of the seven Archangels that stand before the throne of GOD chanting hymns of unending praise. When we pray for his help he intercedes directly to God the Father. He is one of the three angels mentioned by name in holy scripture. St. Raphael appears in the deutero-canonical Book of Tobit, a beautiful narrative in the Old Testament. 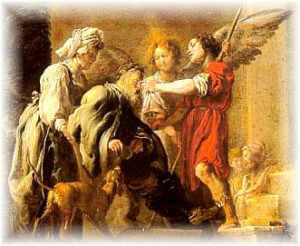 He heals Tobit of blindness, he protects and guides Tobias on his travels and he delivers Sarah from an evil demon. Tobit, Tobias and Sarah were beset by trials and difficulties to purify them, but they remained steadfast in their faith during the period of testing, and eventually enjoyed God’s blessings and mercy. All prayed for deliverance and God sent St. Raphael. The longest recorded speech of an angel is Chapter 12 of the Book of Tobit. The Old Testament is not the only place that St. Raphael makes his appearance in the Bible. Many of the Church Fathers have speculated whether or not he was the angel mentioned in John 5:1-4, which speaks of the pool called Probatica, where the ill were brought for healing: “an angel of the Lord descended at certain times into the pond; and the water was moved. And he that went down first into the pond after the motion of the water was made whole of whatsoever infirmity he lay under.” This account was made the Gospel reading for the Mass of the feast of St. Raphael in the traditional calendar (October 24) — which continues to be observed not only in communities which follow the Extraordinary Form of the Roman Rite, but also in those locales where St. Raphael is a patron. In the Ordinary Form, of course, he is grouped with St. Michael and the other angels on Spetember 29. Raphael is the Archangel of God’s mercy and light, who comes to bring healing to many. He is the medicine of God, who comes to relieve the ills of all burdens, sufferings and to restore God’s people to the truth of God’s love and mercy. He gives graces, given over to him by the Father and glorified by the Son’s love for mankind. He is the Archangel of God’s mercy, who sheds His grace through holy priests and is the one who brings us the good news of God’s mercy and grace.He is the healing and deliverance Archangel, and the patron of travelers, physicians, happy meetings and marriages. His feast day is September 29th. 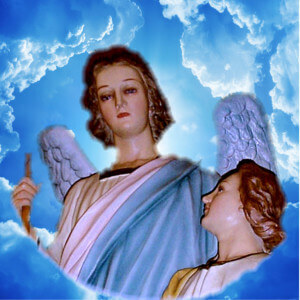 Most Holy Mother, Queen of the Angels and Archangels, send me your Champion, the Archangel Saint Raphael, let him heal me of all my spiritual and physical ailments in JESUS’ HOLY NAME. May he protect me from satan and all the evil spirits. Saint Raphael be my guide and protector on my journey through life. O’ glorious Saint Raphael the Archangel, herald of blessings, pray for us! Amen. Pope St. Gregory the Great calls Raphael “the Medicine of God.” His office is to heal, and he is thus especially the Angel of the Sick. Holy Archangel Raphael, standing so close to the throne of God and offering Him our prayers, I venerate you as God’s special Friend and Messenger. I choose you as my Patron and wish to love and obey you as young Tobias did. I consecrate to you my body and soul, all my work, and my whole life. I want you to be my Guide and Counselor in all the dangerous and difficult problems and decisions of my life. Remember, dearest Saint Raphael, that the grace of God preserved you with the good angels in heaven when the proud ones were cast into hell. I entreat you, therefore, to help me in my struggle against the world, the flesh, and the devil. Defend me from all dangers and every occasion of sin. Direct me always in the way of peace safety, and salvation of my soul. Remember me and always entreat for me before the Face of the Son of God. Help me to love and serve my God faithfully, to die in His grace, and finally to merit joining you in seeing and praising God forever in heaven. Amen. We will take this meditation in steps, first to see and say something about the history of Tobit, who was identified as the father, and Tobias identified as the son. Then a reflection on one chapter of this inspired book in which the Archangel Raphael speaks at length. The longest recorded speech of an angel is in this chapter twelve in the book of Tobias. Then we will make some applications for our own spiritual life drawing on both the experience of Tobias and his family, and especially on what the archangel told Tobias and through him is telling all of us. First then the book of Tobias itself. This book first of all, describes the Jewish people who were taken over by the Ninivites. And among the Jewish people, enslaved by this pagan nation, was Tobias. A captive, we might call him, but a very generous man who practiced extraordinary charity. In his old age he became blind. He sent his son, Tobias, on a long journey to retrieve a long, unpaid debt. Then Tobias’ companion on this journey was what seemed to be, spoke like, and was thought to be a man. But who was the archangel Raphael in human form. He was the companion of Tobias. Raphael rescued the family, especially Sarah, from the powers of the devil. Raphael helped to recover the long, unpaid debt. Raphael prescribed just what should be done for Tobit’s blindness and he was healed. Before this book closes we have a wonderful and I repeat, unduplicated talk call it speech or inspired declaration by the angel. All this while, Tobias, Tobit and the family, thought he was a man. They had planned to reward this very kind human being, by giving him one half of all their possessions. But this archangel, in disguise, said Thank You, and just before the end of the chapter, this generous companion and great helper of the family identified himself as an angel of the Lord. He gives one more short statement to the family and then leaves. I am calling it the speech of Raphael. It is the most extensive, most detailed, and for us the most practical declaration of an angel of God in the whole of the Bible. Bless the God in Heaven. Give glory to Him in the sight of all the world because He has shown his mercy to you. 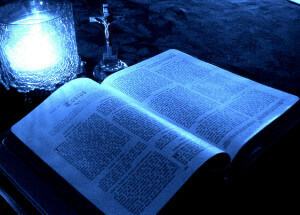 For it is good to hide the secret of a king but it is honorable to reveal and proclaim the works of God. There is good in fasting, alms more than to lay up treasures of gold. For I delivered one from death and the same is that which absolves from sins. Alms provided for finding mercy and the life-everlasting. Those that commit sin and iniquity are enemies are of their own souls. I reveal the truth to you. I will not hide the secret from you. When you pray with tears, and you bury the dead, when you left your meal and without to pick up the dead and keep them in your house during the day and bury them at night, you offer your prayer to the Lord. Because you were acceptable to God it was is necessary that temptation should prove you. Now the Lord sent me to heal you. I delivered Sarah, your son’s wife from the devil. For I am the angel Raphael. One of the seven who stand before God. 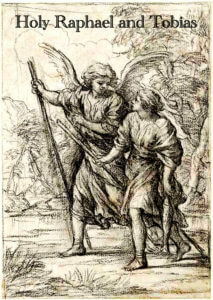 The moment Raphael identifies himself as the angel of God, Tobit and Tobias fell to the ground in dreadful fear, realizing the one speaking to them was an angel of the Lord. Raphael then went on: “Peace be to you. Do not fear for when I was with you I was there by the will of God. Bless Him and sing praises to Him. I seemed to eat and drink with you, but it was an invisible meat and drink. It is time that I return to Him who sent me. But bless God and published all His wondrous deeds.” Having said this Raphael disappeared. I repeat this is the longest prologue, detail of any angels found in Sacred Scripture. Needless to say it was given to Tobit and Tobias who are two men to us. What then are some of the implications of the message of Raphael in our own lives of meditation and devotion? What does “Bless God” mean? To bless God means to speak to God, and as we have seen we begin to pray when we first think of God. We are told that we are to share God, show Him our appreciation of what He has done for us. Talk to God and tell Him how much you need Him and love Him. The more you pray to Him, the more you reap. That is why Raphael replies, “That is why God sends us trials.” We all have grace to remind us to pray to God and to speak to God. In another word to pray. What is he telling us? What Raphael told father and son and is telling us in this language. To publicize what God has done for us. As we have seen before the retreat is over, more than once, the angels will help those who they hear the lines to use. Make known what God has done for you. Proclaim God’s goodness to all. Do not keep God’s gifts to you in secret. Share, communicate what God has given to you. We continue. Raphael insists on prayer as an imperative “Pray, pray, pray.” Talk to God, talk with God. It is all part of our faith—God is always speaking to us. He wants us to engage Him in conversation in prayer. Raphael at length, praises the father for His great charity telling us therefore to practice charity. Practice charity, see the needs of others before they can tell you what they need. The deepest needs of people, they do not expect. Charity begins in the mind. When the mind sees someone in need the heart goes out to that one in need. Finding the need and filling it. Whatever verb we use, help others, assist others, give to others. The deepest need anyone has is our love for them. No matter what we can give them materially, what the human heart most wants is love. Raphael goes on, how this needs to be underlined and memorized. Says Raphael: “God tries those who love Him.” What a statement. This is God’s way of enabling us to grow in our love for Him. Love is in the will. The main reason we have a free will is to love God. But how this needs to be understood, the more demanding, the more difficult, the more reluctant we are to do something, and yet we do it, the more our will is used to do what our conscience tells us is the will of God. Thank God for the trials in your lives. Express your gratitude for the hardships and trials He gives us. Quoting the archangel Raphael, God sometimes enables us who love Him to love Him more through trials. How we need to hear this. God’s graces can be pleasant and enjoyable, but the graces can also be difficult and painful. Never deceive yourself that what is pleasing to us is displeasing to God. Raphael talked to Tobias’ son and is teaching us this. What is the truth? Truth is our minds corresponding with reality. Yet, millions are living in a dream world of unreality. They do not posses the truth, and the truth, I repeat, is the agreement of the mind with reality. I keep telling one audience after another, statisticians tells us that ninety percent of reading American read is fiction. How we need to guard our minds from reading bewitched by the untruth. How do we acquire the truth? We acquire it, of course, from God’s revelation. But it is one thing to say posses the truth-such as there are three persons in one God, or I know that God became man in the person of Jesus Christ, and that Jesus Christ, the living God-man is present here on earth in the Holy Eucharist. But if we are to grow in this peace of mind, we are to grow in our understanding of the truth that God has revealed. That is the main purpose of meditation. By prayerfully reflecting on God’s revealed truth we grow in our grasp and understanding of what God has revealed. And our minds grow in this blessed gift of peace of mind. But, as Raphael told father and son and is telling us, we are to have also peace of heart. A synonym for peace of heart is peace of will. What is peace of heart? Peace of heart is the experience of doing God’s will. And that is the only true source and foundation of joy in this valley of tears. We shall have peace of heart only in the measure that we are doing God’s will. Ah, what an examination of conscience we must all make. How faithful to God’s will am I? How ready am I to accept the cross He sends me? How willing am I to share with others what God has so generously given me? How much attention do I give to prayer in my life? So the litany goes on. Peace of heart is the experience of doing the will of God, and that experience is the happiness of spirit. Know God’s will with the mind and doing it with the will. As Christ later on will tell us, we are to be peace makers. We shall bring peace to others only if we are at peace ourselves. We will bring peace to others by sharing with them the truth which we believe. We shall bring peace to others only in the degree that we ourselves are generous, loyal and doing the will of God. All of this and far more is locked up in the most detailed and deepest revelation of an angel sent by God to teach us how we are to live our lives here on earth in anticipation of joining the choirs of angels in a heavenly eternity. Lord of the angels, we thank you for providing for our needs by sending your angels to help us. Your angel Raphael’s name means “God heals,” send us your angels to heal us from such bodily infirmity as you wish us to have removed. But, dear Lord, heal us especially in our spirit from the sickness of soul so that healthy in mind and body we may bless you, the Lord of the angels, and that we may grow in our love for you, healed by you through your angels here on earth and that we may reach you and join you for all eternity. Father John A. Hardon was a tireless Catholic writer. Some of his best-known books are the Catholic Catechism, the Modern Catholic Dictionary, and the Treasury of Catholic Wisdom. But over and above these, he wrote literally thousands of articles of timeless value dealing with practically all aspects of the Catholic Faith. Many of these are contained in this archive. Upon reading them you will discover the mind and expressions of a saint who always wrote to help his readers more deeply know and love the Catholic Church and her faith. Few, either in the past or in the present, have written about these matters as well as Father Hardon. *Why are Catholic and Protestant Bibles different? This question raises the issue of the biblical canon. Originally, a canon (from the Greek kanon) meant a rod or stick that one used to measure length, and hence a criterion or standard. Catholics and Protestants accept the same 27 inspired books as making up the New Testament. But when we turn to the Old Testament, some significant differences emerge. The decision finally determining the exact number of books accepted as inspired Scripture for Catholics was not made until the Council of Trent in 1546. The Council fathers accepted 46 Old Testament books, following what appeared to them as a firm tradition of the Church from ancient times. The leaders of the Protestant Reformation, on the other hand, rejected some books agreed upon at Trent. The seven disputed books are: Tobit, Judith, Wisdom, Sirach, Baruch and 1 and 2 Maccabees. There are also some sections of Esther and Daniel not considered inspired Scriptures by Protestants. Protestants call these seven books the apocryphal (uninspired)books. Catholics, however, call these same disputed books deuterocanonical. Fortunately, today, modern translations of the Bible are published in Catholic editions. These translations will include an imprimatur (assurance of a Catholic bishop that the text is in line with Catholic teaching) and the seven deuterocanonical books. 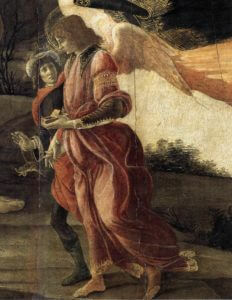 Archangel Raphael to assist man. So begins the story of a decent man who suffers for doing the right thing. In this reading, his situation will only get worse. This is a great narrative with its themes of almsgiving, personal prayer, faithfulness in suffering, and the hidden presence of God in everyday life. Tobit is actually two stories in one—a tale of two Jewish families in the eighth century B.C., both victims of ethnic cleansing by the Assyrian Empire. Tobit, his wife, Anna, and their son, Tobias, are among the Israelites deported to Nineveh. Tobit’s relative, Raguel, with his wife, Edna, and daughter, Sarah, have ended up three hundred miles away, in Ecbatana. Both families are faithful observers of the Mosaic Law, but, assailed by sufferings that make no sense to them, they wonder: Where are the rewards of their devotion? Tobit’s family is battered by job loss, persecution, and blindness. Raguel’s family suffers because of Sarah, who is an innocent lightning rod for calamity. Through it all, however, these ordinary people keep trusting, praying, and doing the right thing. And God breaks into their lives in an extraordinary way. How the two stories come together as God comes to the rescue—through a journey, a fish, and the longest angelic appearance in the Bible—is an uplifting read, with more than a few invitations to laughter. But in a simple way, it touches on a profound truth.